past the hard disk on the way out. 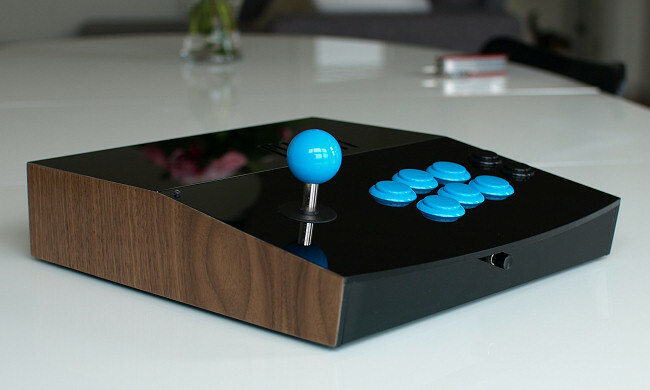 The finished econ - Complete with real walnut veneer! The LS-32 is the choosen because of the small dimensions and short throw. 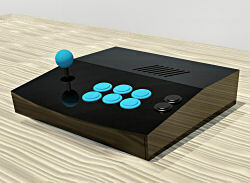 Unfortunately there isn't room for an UltraStik 360, because I wanted to make it as flat as possible to make it look better and play more comfortable. In addition to the encoder I am testing a E-limitator from ArcadeShop.de to see if it is an alternative to the UltraStik. Who knows. Made entirely from 5mm laser cut black acrylic sheet. Acrifix 116 is used for bonding the parts. See step by step for reference. 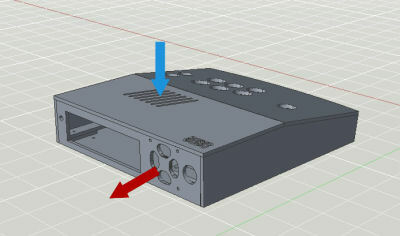 The cabinet will fit any mini-itx board and 2.5" hard disk and provide cooling for it. I recommend a mother board with HDMI. The parts are picked out to be the least power consuming and thus generating the least amount of heat. I would recommend the new AMD Zacate / Fusion platform not. It's much better and faster than Atom. Takes op less space too.